All possession of real estate, tenements, and hereditaments in Arkansas can be transferred by a deed in writing. A grant deed in this state is often used by an owner of real property to grant all his/her interests and rights in the property to another person or entity. A duly executed grant deed contains the guarantees that the grantor has not conveyed the land to any person other than the grantee and that the grantor has not encumbered the property with a lien. 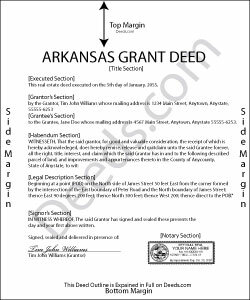 A grant deed in Arkansas is similar to a warranty deed, but does not include the further assurances that are present in a warranty deed ( 18-12-102). A grant deed in this state must be duly acknowledged or proved by an authorized officer before it can be accepted for recording ( 18-12-201). All grant deeds and other instruments in writing for the conveyance of real estate are required to be acknowledged or executed in the presence of two witnesses who are not otherwise involved in the transaction, or acknowledged by the grantor in the presence of two such witnesses, who should then subscribe the deed. If the witnesses do not subscribe the grant deed as described at the time of execution, the date of their subscribing it should be stated with their signatures ( 18-12-104).When a court or officer takes proof or acknowledgement of a grant deed, they must have a certificate of the proof or acknowledgment endorsed on the instrument ( 18-12-205). All deeds, including grant deeds, by which the title, in law or in equity, to any real property within the state is affected, which are required by law to be acknowledged or proved and recorded will be constructive notice of the contents to all persons from the time the deed is recorded in the office of the county recorder in the county where the property is located. A grant deed will not be good or valid against a subsequent purchaser of the same real estate for a valuable consideration without actual notice thereof or against any creditor of the person executing such an instrument containing a judgment or decree which by law may be a lien upon the real estate unless the grant deed, duly executed and acknowledged or proved as required by law, is filed for record in the office of the county clerk in the county where the real estate is located ( 14-15-404).